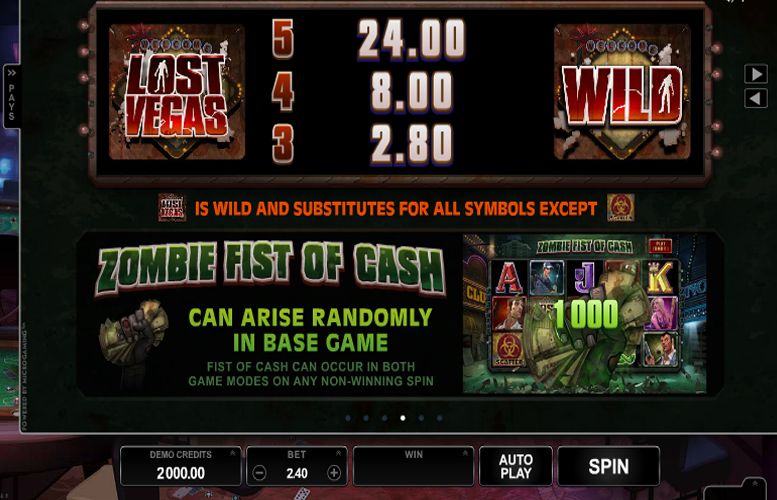 The Lost Vegas slot machine from Microgaming sees the mecca of global gambling overrun by brain eating zombies. It’s not clear where they’ve come from but that hardly matters when faced with a swarm of such beasts marauding through Sin City! Players can choose whether they want to play as a survivor or a zombie (hint, the zombie artwork is much more pleasing to the eye!). Along with different illustrations, each game mode has a different Free Spins Mode. Let’s look closer at what this title has to offer. Fantastic art style. The gritty, cartoony illustrations give this machine a real character all its own. Great bonus features and the ability to choose between the different game modes gives Lost Vegas a lot of replay value. Tragically low main game prizes. If you prefer to hit huge winning combinations off a single spin, perhaps this title isn’t for you. Bizarre betting limits and prize distributions. Of course, it must be hard to ensure that your game pays out according to the return-to-player rating, but 1.3 recurring multiplied by the total bet is just weird! Radioactive “Scatter” Symbol = 75x the total bet. Game Logo “Wild” Symbol = 10x the total bet. Red Survivor/Zombie = 8.3x the total bet. Orange Survivor/Zombie = 6.6x the total bet. Green Survivor/Zombie = 5x the total bet. Purple Survivor/Zombie = 4.16x the total bet. Blue Survivor/Zombie = 3.3x the total bet. These payouts mean that the max win in the game is 97,000. 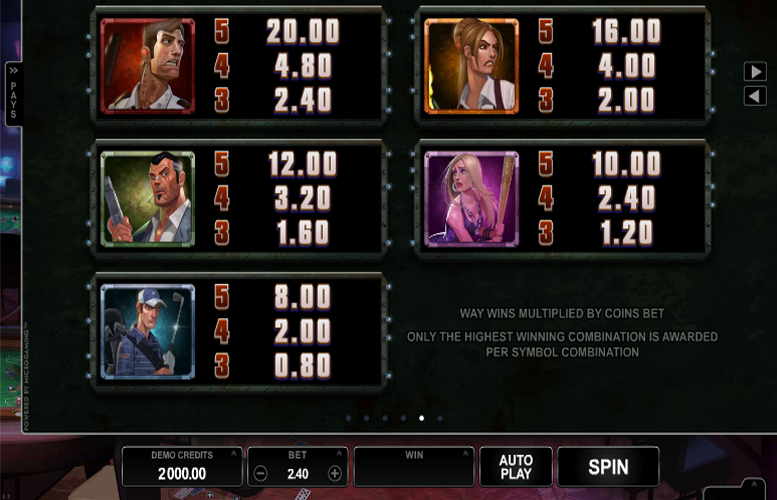 Players are invited to play as either survivors or zombies in the Lost Vegas slot machine. Along with the artwork for the game itself, there is a different free spins bonus feature depending on which mode you pick. Both free spins modes are activated by hitting three or more Radioactive “Scatter” symbols anywhere on the game board. 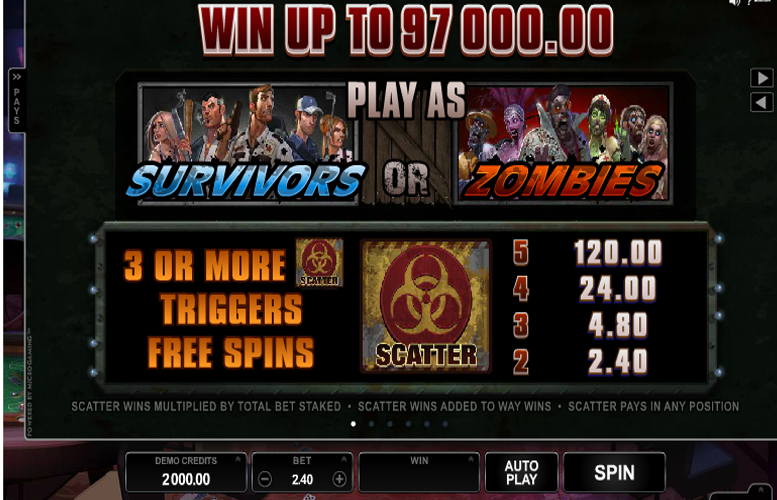 In the Survivors Free Spins feature, players are awarded free spins with the Stash Feature. This means that any Ace, King, Queen, Jack, or Ten symbol that lands will be removed from the free spin reels. Each time a symbol is removed, additional cash is added to the total prize stash. Following this, winning combinations are paid again after the symbols are stashed. The entire stash prize is awarded at the end of the Free Spins Mode. The spins will continue until no further face card symbols are landed. 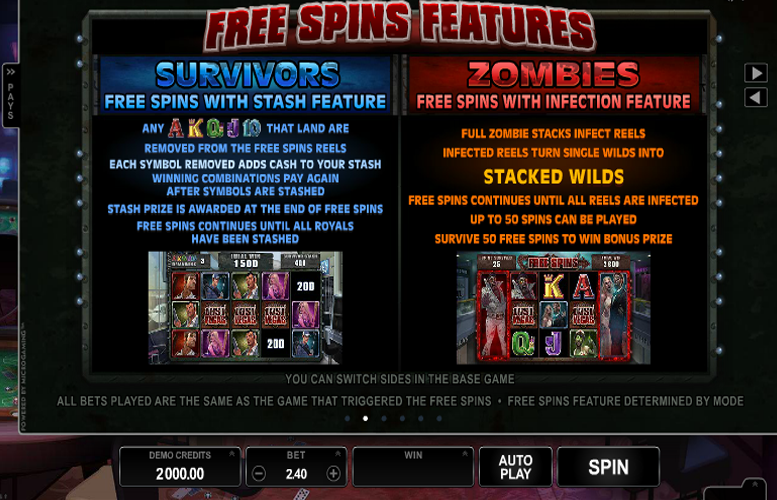 In the Zombies Free Spins feature, players are awarded free spins with the Infection Feature. This mode will cause full stacks of zombies to infect the reels. Those reels infected will also turn single “Wilds” into Stacked “Wilds”. The free spins will continue until all reels are infected or a total of 50 spins have been played. If players are fortunate enough to survive all 50 free spins, they will also receive a bonus prize. The Blackout Bonus can strike at random at any point during the base game. When it does, all high value symbols on the reels award an instant prize. What’s more, during the Blackout Bonus, just a single radioactive “Scatter” symbol is needed to trigger the Free Spins Mode. 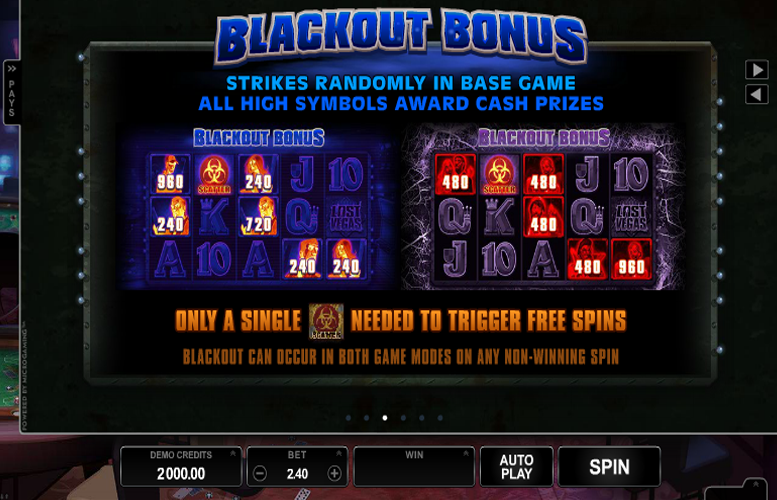 The Blackout Bonus can occur in both the Zombie and Survivor game modes and on any non-winning spin. The Zombie Fist of Cash bonus can also be triggered at any point during the base game. It awards an instant high value prize at random. Ace = 2x the total bet. King = 1.83x the total bet. Queen = 1.6x the total bet. Jack = 1.5x the total bet. Ten = 1.3x the total bet. 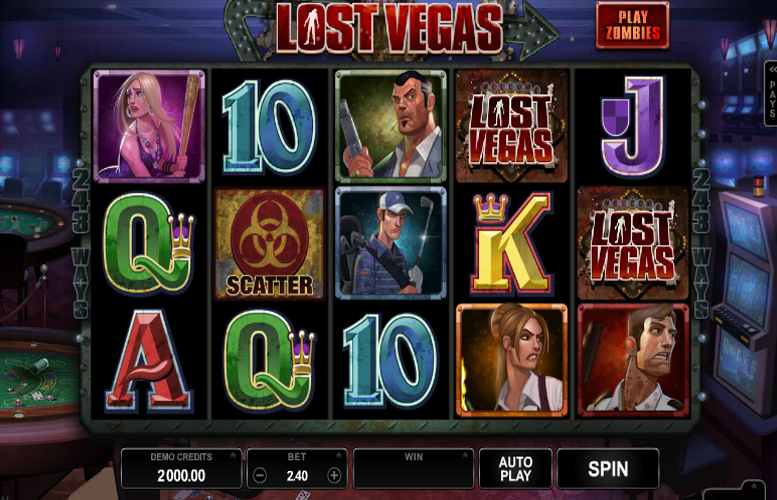 Players are only given the opportunity to adjust the size of the total bet on the Lost Vegas slot machine. These range from 30p up to a rather unimpressive £45. Although many players will find this upper limit more than adequate, we can see some high rollers considering it to be overly limiting. All things considered, the Lost Vegas slot machine from Microgaming has the makings of an absolute favourite machine for us. It has a really cool subject matter that entirely lends itself to an action-packed slot machine. Unfortunately, the title kind of falls short of expectations. There isn’t really a proper second screen game feature and this feels like a sorely missed opportunity given the excellent artwork throughout. On top of this, the main game prizes are pathetically low, and both the maximum betting limit and prize distribution are downright bizarre. This game has a rating of 4 / 5 with 478 total reviews by the users.